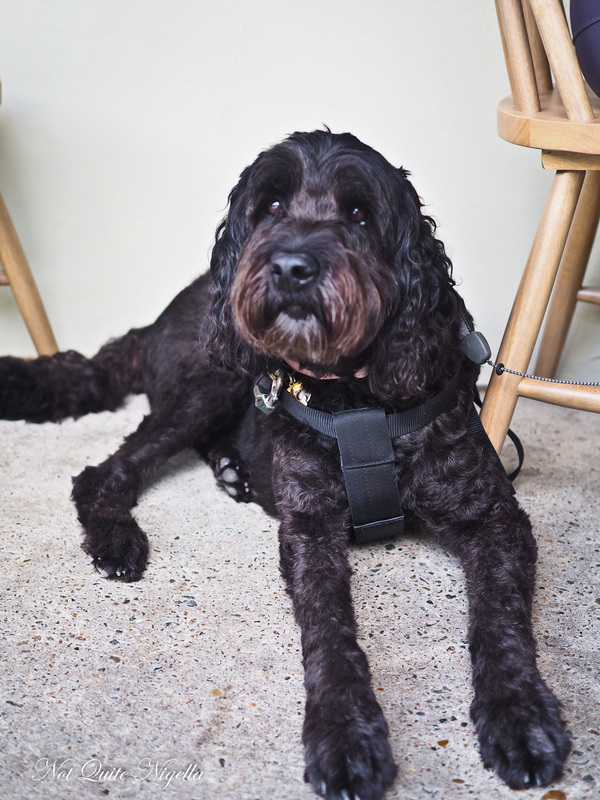 Looking for a dog friendly cafe that also serves us a mix of indulgent and healthy? 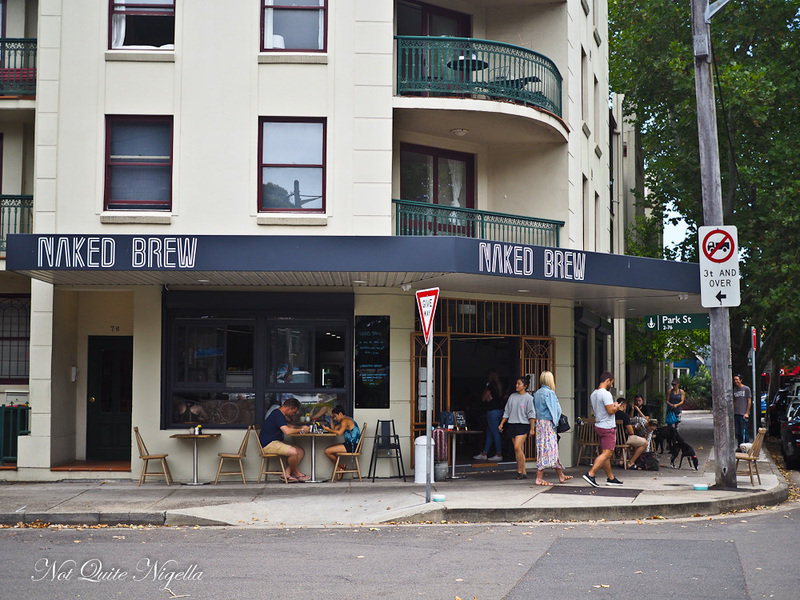 Naked Brew on Swanson Street in Erkinskineville was the perfect place to go with Nina, Mr NQN, our dog Mochi and her dog Samantha! I get an idea of the sort of parents Nina and I would be. 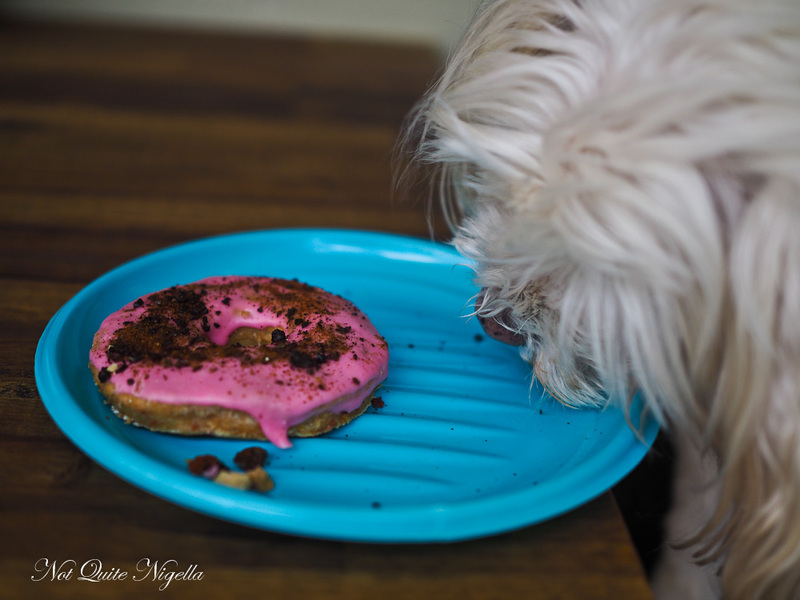 When I see the small dog treat menu (one donut, two drinks) at Naked Brew I want to order Mochi a donut and a drink. Nina shakes her head, "I think they can both share one treat," she says and gives me the look that she'd probably give Samantha when she asks for more food. "Okay," I murmur knowing that she's probably right and making the link between her discipline and abs. 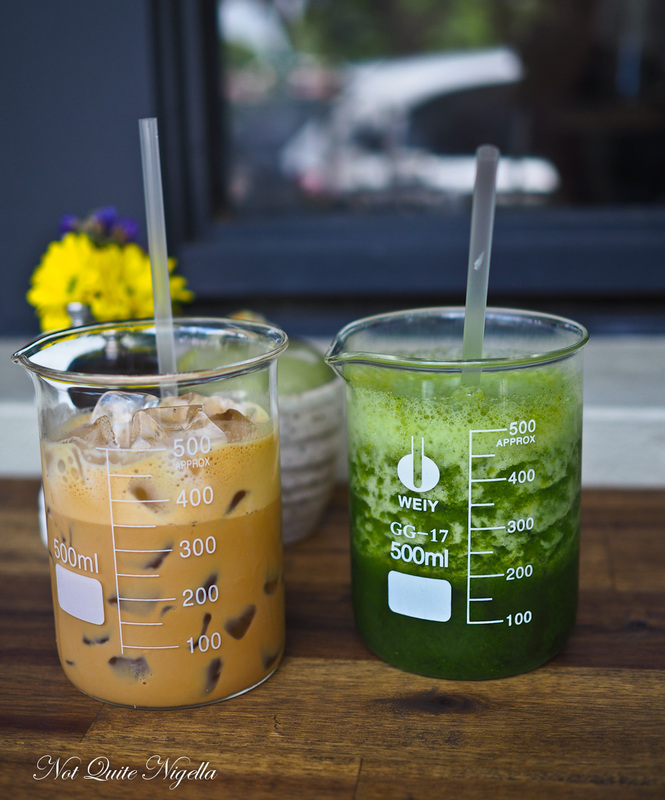 Nina then looks at the healthiest sounding juice on the menu but her brow furrows. "Swiss chard?" she wonders aloud. "How can they put cheese in a juice?" she asks mistaking chard for cheese. 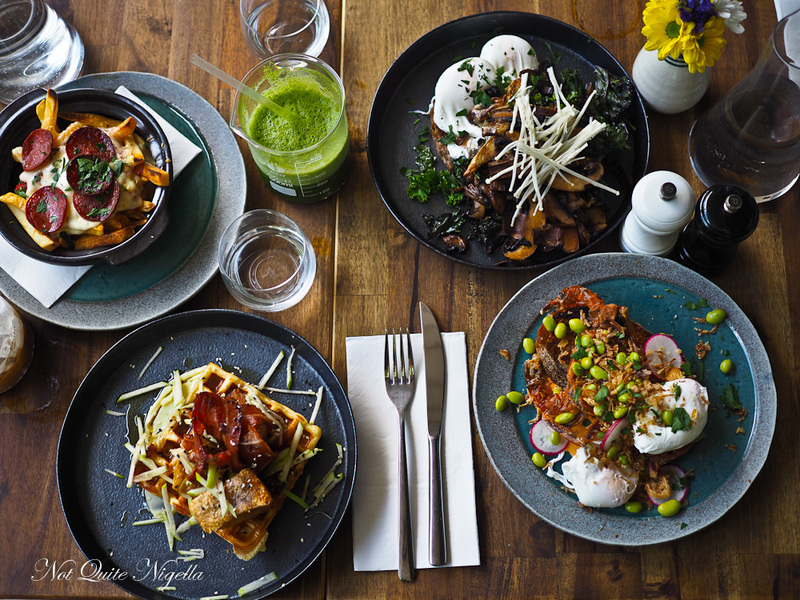 Nina choose her dish from the "Everyday Goodness" page that features healthier items as well as a few vegetarian dishes. 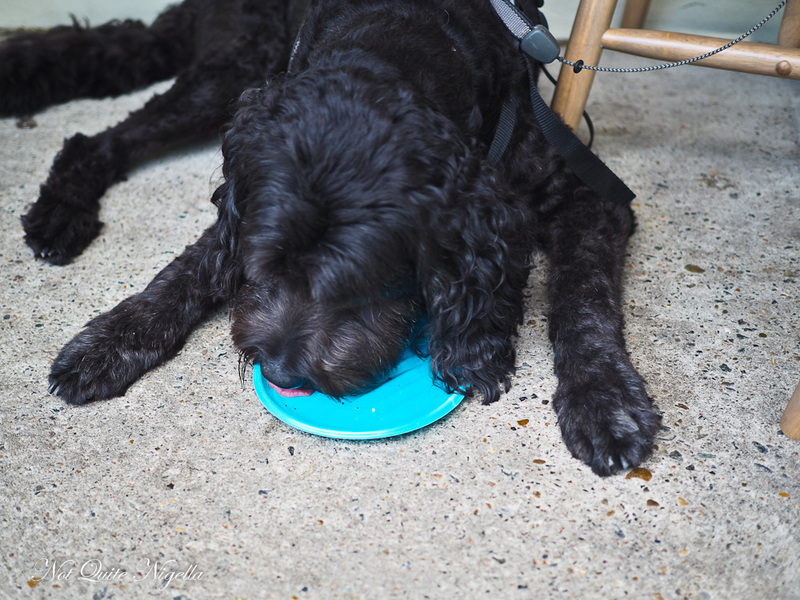 Her eyes widen when they set the plate down. It's enormous and I think we have convinced her that leaving her enclave of Bondi Beach is a good thing. 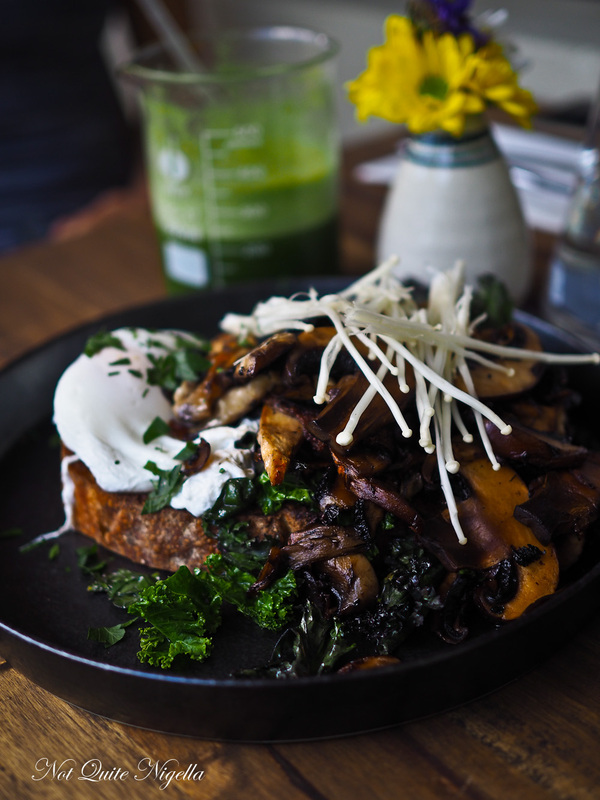 There's a thick but fresh piece of Flinders Ranges sourdough topped with a medley of mushrooms, poached eggs, tomato relish, pan fried Swiss chard and kale. She adores it and polishes off every speck. We chose our food from the "Unbelievable/ Unforgettable" page of the menu. 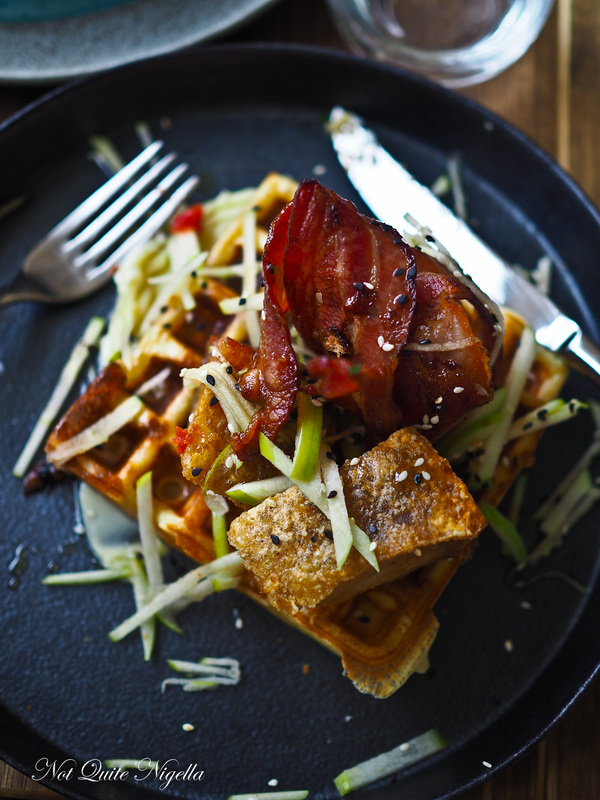 There are three cubes of crunchy crackling pork belly atop a thick waffle with American bacon, green apple, maple syrup and wasabi mayonnaise. And it's so delicious I don't want to share it any more. The pork goes so well with the sweetness of the maple and the caramelised waffle and the wasabi mayonnaise really lifts it from becoming too unctuous or rich. 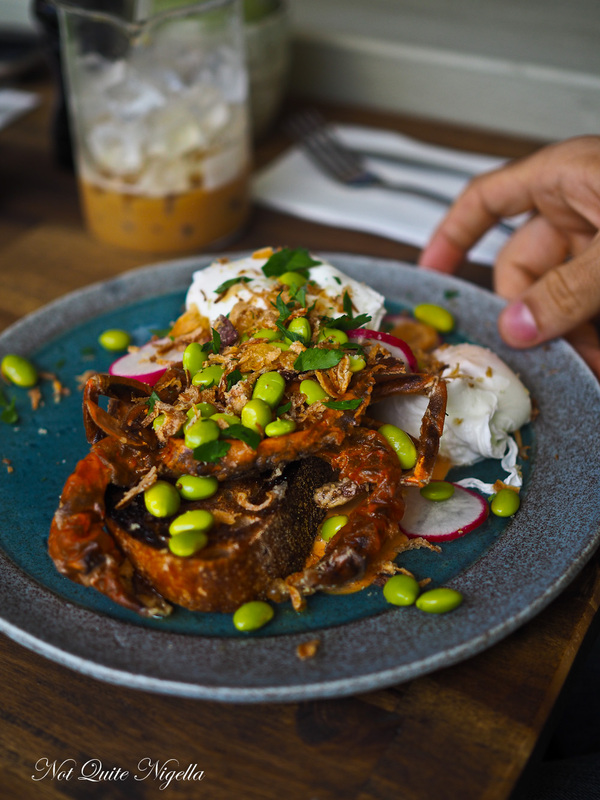 Alas I am not as in love with the soft shell crab benedict. I take the second half after Mr NQN and my egg, while runny yolked has a big pocket of water that comes out when I cut into it. The soft shell crab also has a bit of water in it and with rather wet toast I leave it be. I have to say though that Mr NQN loved this so it might have just been bad luck in my half. We change back. 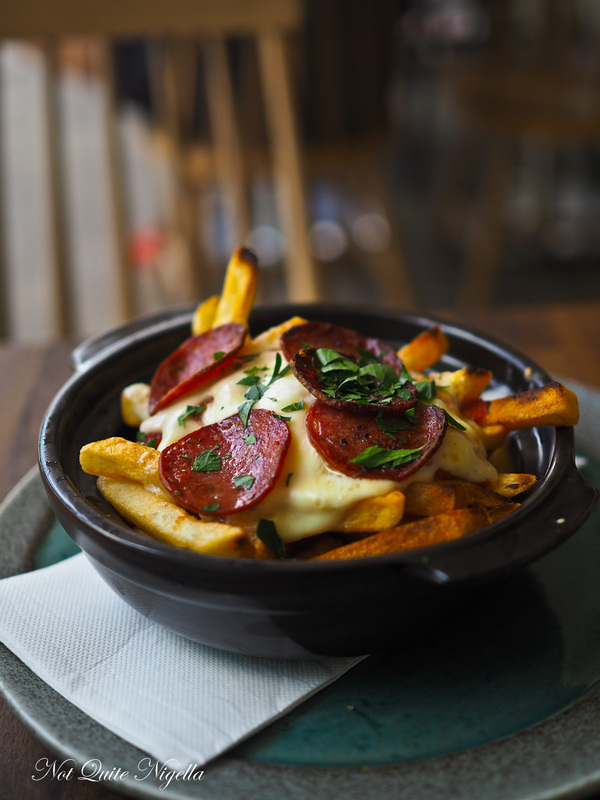 I love the idea of pepperoni fries and these are fries with smoked buffalo mozzarella, tomato sauce and discs of pepperoni. It's not bad but I would have loved the pepperoni chopped up so you could get some in every bite. We mustn't forget our well behaved four legged friends. Mochi spends the whole time perched on Mr NQN's lap watching Sam below. The two get along well but more as neighbours that will say hello and leave it at that rather than close friends. Nina suggests that Mochi try her half first. 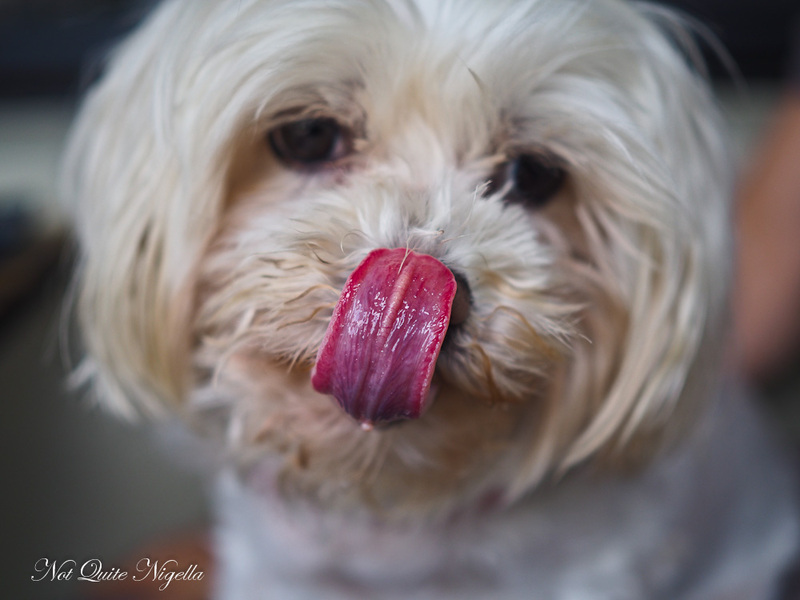 She regards it for a few seconds before licking at it delicately. 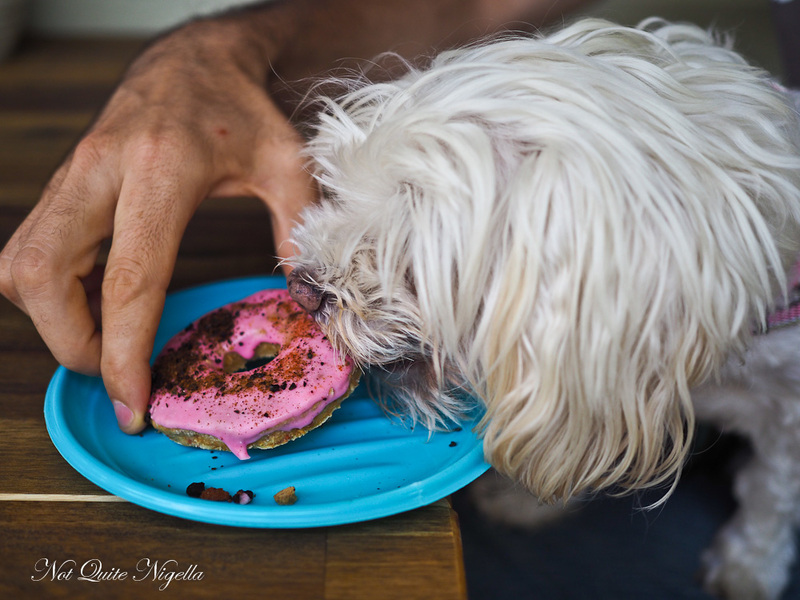 Then after a few seconds she decides that she loves the raspberry domut and cranes her neck to lick enthusiastically. I break it in half and take the other half to Sam. I reach for the camera to take a photo of Sam with it and within a split second she swallows it and gives me a smile. Yes I was way too slow for that one! And Mochi is still slowly biting and licking at her half. So tell me Dear Reader, would you order from the Unbelievable menu or the Everyday Goodness menu? 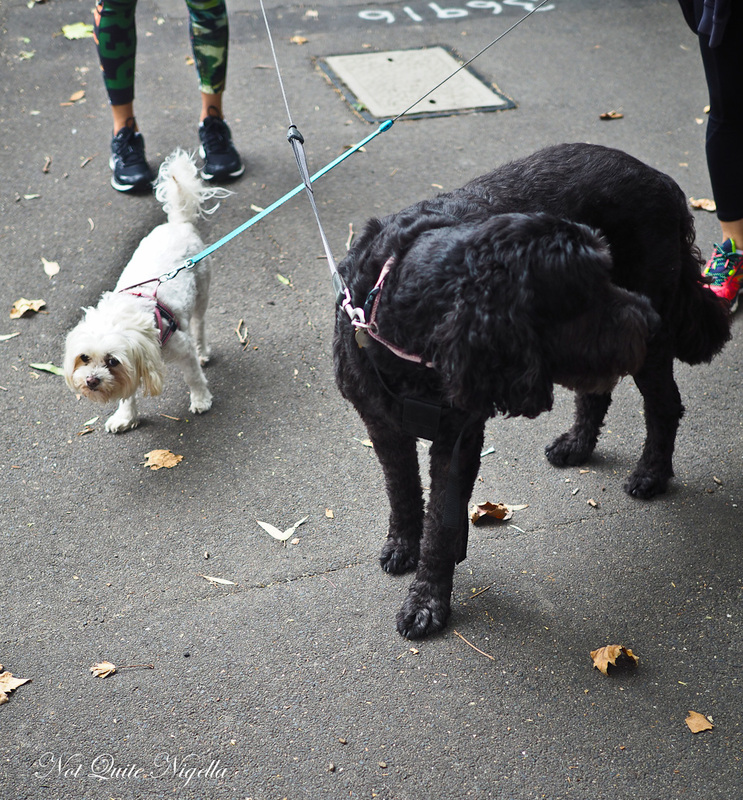 Do you know any good dog friendly places?